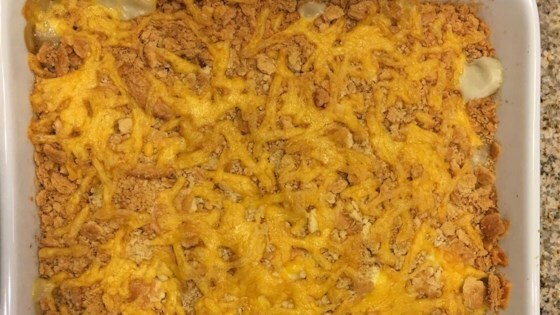 "This is a recipe my mother always made on special occasions--it was the only casserole dish my father would eat. My husband had never eaten asparagus until we married 25 years ago and now always requests this dish when asked what he would like on special occasions. It is so easy and so delicious!" Place eggs in a saucepan and cover with cold water. Bring water to a boil and immediately remove from heat. Cover and let eggs stand in hot water for 10 to 12 minutes. Remove from hot water, cool and peel and slice. In the prepared dish layer 1 1/2 cans of asparagus, 1 can mushroom soup, 2 eggs and 1 cup of crushed crackers. Repeat layers with remaining ingredients. Cover and bake in preheated oven for 25 minutes. Remove cover and top with grated cheese. Cover and bake an additional 5 minutes, or until cheese is melted. See how easy it is to whip up a light, fluffy soufflé. Asparagus is my favorite, but I have to agree with Stacey, expensive and not so good. I changed the recipe a tiny bit by steaming fresh asparagus instead of using the canned asparagus. Overall, this is an awesome recipe and all the flavors just came together! Great recipe!!!! I left the boiled eggs out since my son does not like them and it was still excellent. Will definitely be using this recipe again. My husband said this was a keeper!